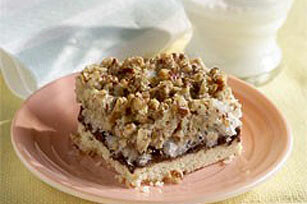 A buttery crust holds layers of coconut, chocolate and a creamy pecan mixture in these luscious baked bar cookies. Preheat oven to 350°F. Beat 1/2 cup of the margarine and 1/4 cup of the sugar in large bowl with electric mixer on medium speed until creamy. Add flour; beat until well blended. Press dough firmly onto bottom of ungreased 9-inch square baking pan. Bake 18 to 20 minutes or until edges are lightly browned. Place remaining 1/2 cup sugar, remaining 1/4 cup margarine and the cream in medium saucepan; cook until margarine is melted and mixture is well blended, stirring frequently. Stir in pecans; set aside. Sprinkle coconut and chocolate evenly over crust. Top with the pecan mixture; spread to evenly cover chocolate layer. Bake an additional 20 to 25 minutes or until golden brown; cool completely. Cut into 24 squares to serve. Store in airtight container at room temperature. At 24 servings, this fun recipe is great for a party or classroom celebration. If using a 9-inch glass baking dish, reduce oven temperature by 25°F.